Got an itch for something sweet, but don’t want any added sugar? Try our Banana Chocolate Chip Coconut Cupcakes, they are easy to make, and super healthy, just what your body needs. They have no added sugar other than what comes from the bananas and dark chocolate chips. Visit our STORE if you don’t have all the ingredients or click on Tropical Traditions. For those of you who would like to learn more about the amazing benefits of coconut oil, check out Mark Sisson’s article on Smart Fuel. Very informative as always. Heat coconut cream and coconut oil in microwave for 40 seconds. Stir with a spoon so to make sure that there are no lumps left. Bake for 20 minutes and you are ready to enjoy an amazing dessert, breakfast or afternoon snack! My son is on a Low Glycemic Index diet and this recipe looks wonderful for him! Does anyone have an idea for a good replacement for bananas in this recipe? He can’t have bananas because of it’s high glycemic count. HA! I was going to ask you to email me this recipe so I could have a nice sweet snack that was healthy. Then I checked NuttyKitchen and there it was. Muah!! Love you!! Can’t wait for this weekend. This looks really great and I would love to try it! I am curious about the carb content in Coconut flour. I have avoided it up until now since I am a diabetic and wasn’t sure how it would affect my blood sugars. I do use almond flour – do you think they are similar, carb-wise? Unfortunately it’s difficult for me to convert what 100 grams means on the label with the standard US measurements of “cups.” Any thoughts? Hello Sarah and thank you for visiting! I just discovered your blog through wordpress and have to say I see some great, yummy looking, gluten free recipes: yam and kale fries look excellent. what do you recommend for a spritzer to the olive oil? Also, just found out this weekend that my daughter cannot have dairy or eggs in addition to gluten. I already have an egg replacer (ground salba and water) but any suggestions for an almond flour substitute (she’s allergic to that too) for these cupcakes/loaf? Oh we are so sorry to hear such news of your daughter. 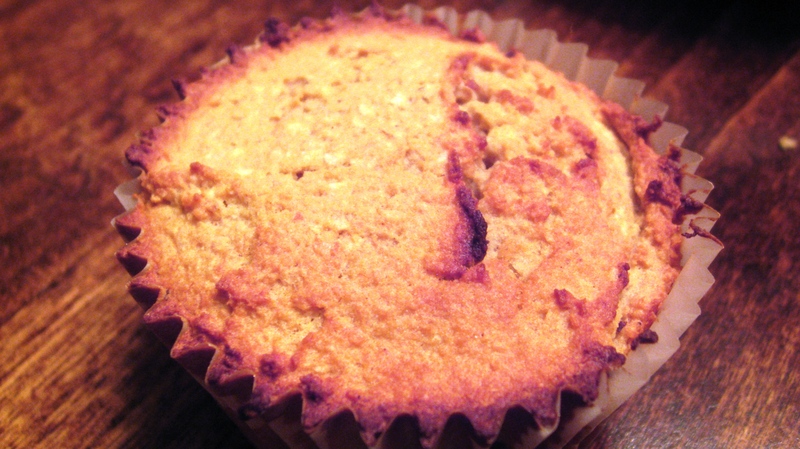 But you can still enjoy the cupcakes if you substitute coconut flour. They will not be as fluffy, but will still be good. Coconut flour tends to be a bit thicker, so please just know that in advance. The sprayer that we use for our olive oil is a Misto sprayer refillable, washable and stainless. I put one up on our store page, but you can get them at Bed Bath and Beyond, Crate and Barrel and of course Sur la Table. The prices should all be about the same. As a side note (of hope?) 🙂 both my husband and I used to be totally lactose intolerant until we cut out grains along with gluten. Now we buy our milk from a local raw milk dairy farm and get local farmers market eggs and have no more problems. Hello Christine, thank you :-). We use blanched almond flour because it makes them very fluffy. The meal weighs it down a little. We haven’t made them in a while thanks for reminding me. I’m trying to stay away from any nut flour because of the PUFA content (and especially baking with it because of oxidization). I have heard coconut is denser and drier. Just wondering if I can use a cup of coconut with no almond flour. What if I add extra egg? Also wondering about the banana. Did you mash it first? When you say “blend”… were you talking mixing in a bowl or actually using a blender? I have made batters in my high-speed Blendtec Blender. However, it would end up as a smooth blended batter. I was thinking of using the Blendtec and then adding the coconut flakes and chocolate chips afterward… unless you meant for them to be broken down for a smooth batter. Please clarify. Thanks!